A FRIEND OF MINE GAVE ME A CALL IN THE "KINGDOM" ON THE OLD FASHION TELEPHONE ASKING IF I WOULD BE INTERESTED IN A ROAD TRIP. OF COURSE I SAID SURE AND WILL PACK MY TOOLS AND XENA WILL GET THE COOLER READY WITH THE FOOD. SINCE XENA IS HOME SCHOOLED IN THE "KINGDOM", SHE WILL BE COMING ON THIS ADVENTURE AS FIELD TRIP. XENA AND I WERE READY IN A COUPLE OF HOURS WHEN MY FRIEND'S OTHER SEMI PICKED US TO GO AND GET HIS BROKEN SEMI ON THE WINTER ROAD. 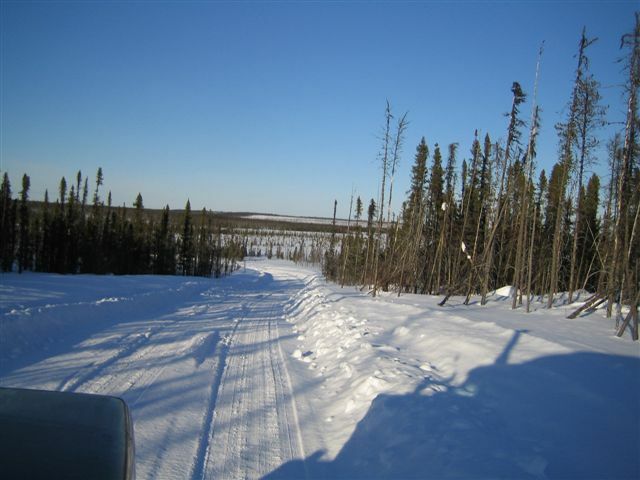 THE WINTER ROAD IS OFFICIALLY CLOSED BY THE GOVERNMENT BUT IT IS STILL BEING USED TO GET THE LAST OF THE FREIGHT HAULED IN TO THE REMOTE COMMUNITIES. LOTS OF SNOW AND BUSH FOR MILES AND MILES. 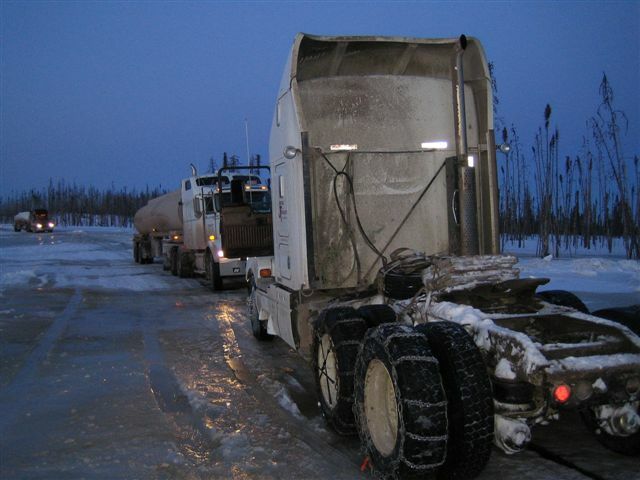 WE WERE ABLE TO CATCH UP TO A COUPLE OF OTHER TRUCKS THAT WERE HEADING IN ON THE WINTER ROAD. THE TRUCKS A HEAD OF US MADE THE WATER CROSSING WITH NO PROBLEM BUT SINCE WE ARE BOB TAILING AND HAVE NO WEIGHT ON THE DRIVE WHEELS OF THE SEMI. THE DRIVER OF THE SEMI HAD TO USE A LITTLE SPEED AND BOUNCE THROUGH THE WATER CROSSING. THE SEMIS AHEAD OF US WAITED TO MAKE SURE WE MADE IT THROUGH THE WATER CROSSING. IN THE BUSH YOU HAVE HELP EACH OTHER TO SURVIVE. 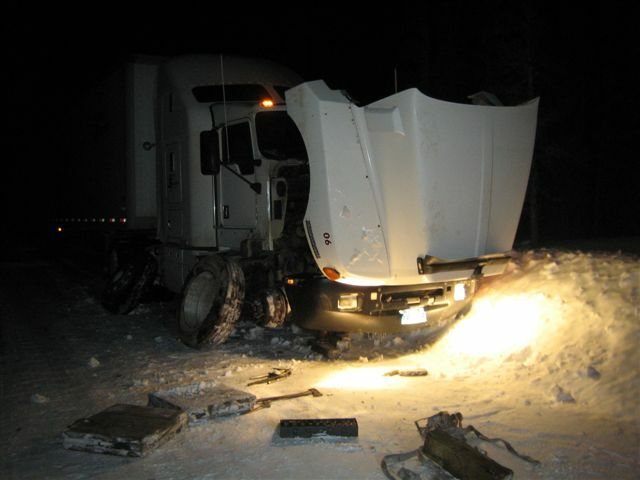 HERE IS THE BROKEN SEMI THAT WE TRAVELLED UP TO FIX AND RETURN TO THE "KINGDOM" WITH WHILE THE OTHER SEMI TAKES THE TRAILER AND DELIVERS THE LOAD. WHAT HAD HAPPENED ON THE 4 DAY ADVENTURE THAT THIS TRUCK ONLY MADE A SHORT DISTANCE IN THE BUSH WOULD MAKE FOR A GOOD EPISODE OF "ICE ROAD TRUCKERS". XENA STARTED CALLING THE TRUCK THE "WHITE THING" BECAUSE EVERYTHING AND ANYTHING WILL GO WRONG WHEN DRIVING THIS TRUCK. WE FOUND OUT THAT THE TRUCK DID NOT MAKE UP ONE OF THE SNOW COVERED HILLS. WHEN DOING A TANDEM PULL, THE CHAIN BROKE AND WENT THROUGH THE RADIATOR WHICH IS NORMAL. THEN AFTER GETTING THE RADIATOR TEMPORARILY FIXED TO GET THE SEMI UNDER WAY. 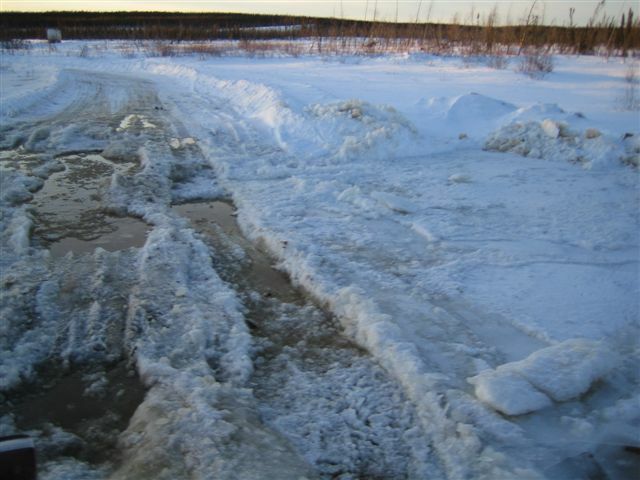 THE "WHITE THING" ONLY TRAVELLED TO THE NEXT WATER CROSSING TO HAVE THE FRONT WHEEL GET BENT WHEN IT CRASHED THROUGH THE ICE. THEN WITH A TIRE GOING FLAT THE DRIVER CONTINUED TO DRIVE GAINING SPEED TO MAKE THE HILL AT THE START OF A BAD CURVE. 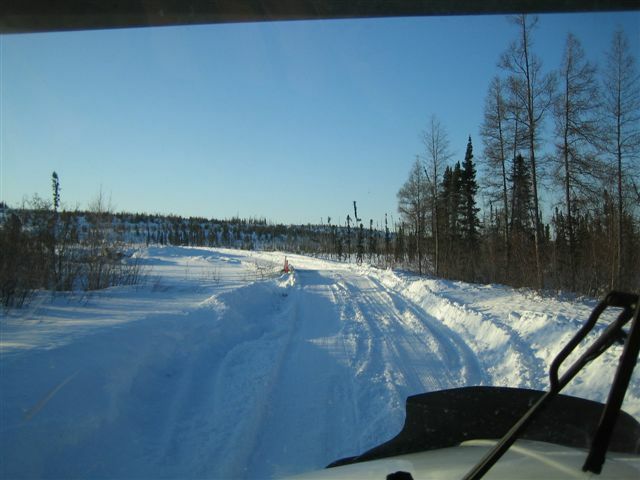 (in the great white north all water crossings are at the start of hills for some reason. this is to add adventure to any trip, lol) BUT THE "WHITE THING" DID NOT MAKE THE CURVE BECAUSE OF THE LACK OF AIR IN THE STEERING TIRE. 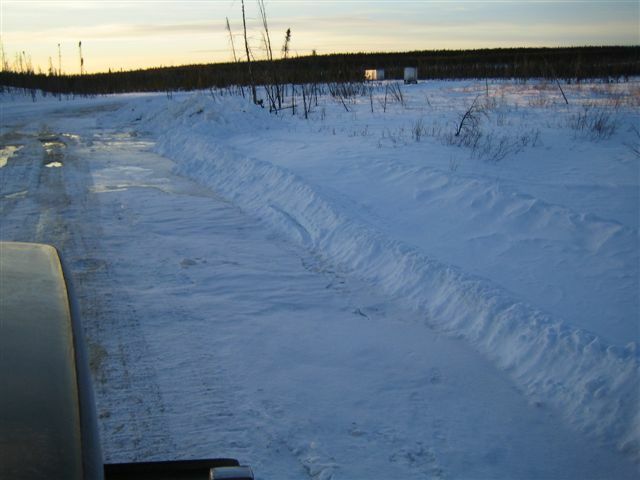 GOOD THING FOR THE DEEP SNOW BANKS BECAUSE THEY STOPPED THE TRUCK PRETTY QUICKLY. 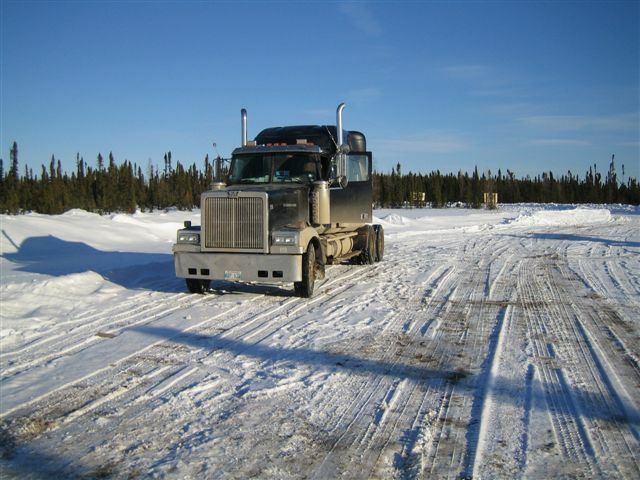 WITH THE HELP OF OTHER SEMIS THEY WERE ABLE TO GET THE "WHITE THING" PULLED OUT OF THE SNOW BANK AND BACK ON THE WINTER ROAD. XENA AND I ARE CHANGING OUT THE TIRE PLUS CHECKING FOR OTHER DAMAGE FROM THE POT HOLE IN THE WATER CROSSING. WITH THE "WHITE THING" UP AND RUNNING AND THE TRAILER HOOKED ON TO THE OTHER SEMI. XENA AND I BACKED UP FOR ABOUT 5kms UNTIL WE CAME TO A PLACE WIDE ENOUGH TO TURN THE "WHITE THING" AROUND. ONCE TURNED AROUND WE HEADED TO THE WATER HOLE THAT WE KNEW WE WERE GOING TO HAVE FUN CROSSING. SINCE THE FRONT AXLE ON THE "WHITE THING" HAS BEEN MOVED BACK 4" FROM THE LAST HIT ON A WATER HOLE WHICH BENT THE THICK ALUMINUM TIRE RIM. I HIT THIS WATER HOLE WITH JUST ENOUGH SPEED NOT TO MAKE IT THROUGH BUT NO DAMAGE TO THE TRUCK. FOR A LITTLE EXERCISE AT 1:30 IN THE MORNING I DECIDED TO USE MY AXE AND VEE OUT THE WATER HOLE SO THE FRONT WHEEL COULD CLIMB OUT OF THE WATER HOLE. OF COURSE THIS DOES NOT WORK BUT I GOT NICE AND WET FROM THE WATER SPLASHING ON ME FROM EVERY HIT OF THE AXE, LOL. 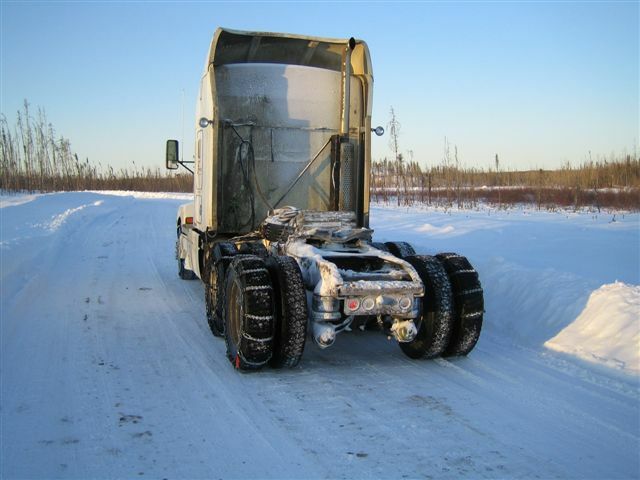 THE "WHITE THING" IS USELESS WITH NO WEIGHT ON THE DRIVE WHEELS EVEN WITH TIRE CHAINS ON. 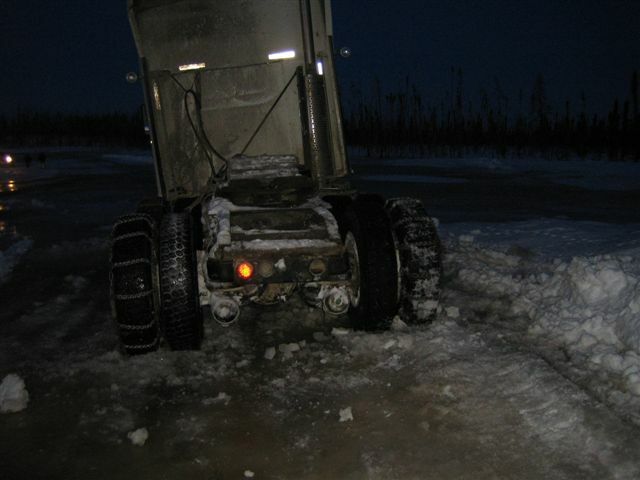 THE CHAINS JUST DIG THE ICE DOWN UNTIL THE INSIDE TIRES ARE ON THE ICE. 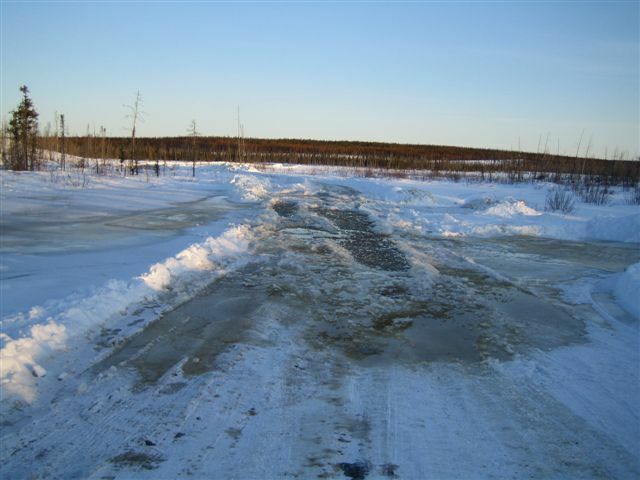 ONCE THE INSIDE TIRES TOUCH THE ICE THERE IS NO TRACTION. THESE FANCY NEW TRUCKS WITH AIR BAG SUSPENSION CAN'T HAVE TIRE CHAINS ON THE INSIDE TIRES BECAUSE THE CHAINS WILL RIP HOLES IN THE AIR BAGS WHICH WILL CREATE A WHOLE BUNCH OF NEW PROBLEMS. XENA AND I GOT TO SPEND THE NIGHT SLEEPING IN THE SEMI BUNK WHICH WAS NOT LEVEL, FOR SOME REASON THESE DIGITAL CAMERA DON'T SHOW THE TRUE ANGLE OR DEPTH IN THE PICTURES. PLUS THE FANCY COMPUTER WARNING ALARM WOULD GO OFF EVERY HOUR BECAUSE THE RADIATOR WAS LOW ON COOLANT BECAUSE OF THE SLIGHT LEAK OF A BROKEN CHAIN, LOL. BY 5am IN THE MORNING TRAFFIC ON THE WINTER IS GETTING BACKED UP BECAUSE THE "WHITE THING" IS BLOCKING THE ONLY WAY THROUGH THE WATER CROSSING. A LITTLE PULL BY A SEMI AND THE "WHITE THING" WAS OUT OF THE WATER HOLE WITH NO DAMAGE. WHEN WE PULLED THE "WHITE THING" OUT, XENA WATCH UNDERNEATH THE TRUCK TO MAKE SURE THAT THE OIL PAN OR FUEL LINES WERE NOT DAMAGED. SHE SAYS THEY CAME VERY CLOSE TO TOUCHING. THIS IS DEFIANTLY A CANADIAN PICTURE TAKEN ON MARCH 31 2009. LOTS OF SNOW, TIRE CHAINS AND SUNSHINE WHICH IS THE GREAT WHITE NORTH. 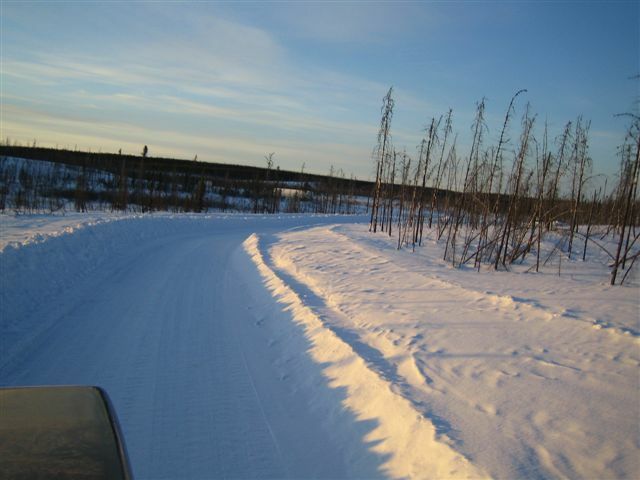 THE LAST AND FINAL PICTURE FROM THE "WHITE THING" ON THE WINTER ROAD.